Emma Shelton, research biologist and first executive director of the ASCB, passed away March 29, 2017, at her home in Bethesda, MD, not far from Society headquarters. She was 96 and died from complications of Alzheimer’s disease. University of Maryland, College Park, graduating in 1941. She earned a master’s in zoology from George Washington University in 1946, worked as a cytology technician at the National Cancer Institute (NCI), and spent a year studying at the University of Chicago. She became the first woman awarded a full scholarship from the NCI to earn her doctorate, which was awarded in cell biology by Brown University in 1949. 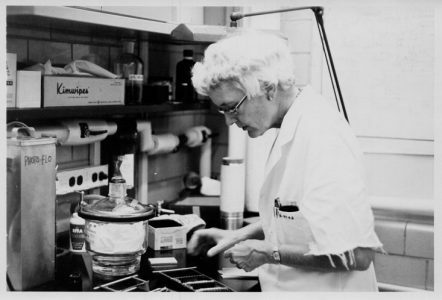 She returned to NCI as a research biologist and was one of the first women there to run her own lab. Shelton published many ground-breaking, peer-reviewed articles on cell biology as it related to the causes and spread of cancer. According to an obituary published in The Washington Post on April 9, “She served as a mentor and inspiration to many students, technicians, and aspiring scientists and professionals who were fortunate to know or work with her.” The NCI awarded Shelton the Public Health Service’s Superior Service Award “for fundamental contributions to an understanding of biological organization at both the cellular and molecular levels” upon her retirement in September 1978. After a long scientific career, Shelton turned her attention to ASCB, the growing scientific society to which she had belonged nearly since its inception in 1961. ASCB’s membership rolls were growing, and by the early 1970s, it had become apparent to Society leadership that help was needed to manage its affairs. Up to that point, all ASCB business had been handled by whoever was serving as the group’s secretary, who at the time was Nancy Bucher, and a part-time administrative assistant. Bucher was still a full-time investigator, and the Society decided that a paid executive director was needed. Shelton became ASCB secretary and served concurrently as ASCB’s first executive director from 1978 to 1981. She researched how other scientific societies ran their central offices and put in place many of the defining elements still evident in ASCB today. ASCB’s central offices were officially founded on October 1, 1978 in a small house in Bethesda. Shelton hired the office’s first employees, helped update the membership database, and implemented ASCB’s first computer system to manage this database, as well as to automate the screening and printing of abstracts for the Annual Meeting program. She wrote grants to establish the Society’s first travel awards so that young researchers could attend the Annual Meeting. She even created and wrote the first editions of the ASCB Newsletter. After setting the wheels in motion for a strong ASCB executive office, Shelton remained active, spending time traveling, birdwatching, and volunteering for many nonprofit organizations. Memorial contributions in Emma Shelton’s name can be made to the Audubon Naturalist Society, (www.audubonnaturalist.org) or the Southern Poverty Law Center (www.splcenter.org).